A mile-deep rift valley that could rival the dramatic chasms of America’s Grand Canyon has been found hiding beneath the ice in West Antarctica. UK scientists behind the discovery believe it is contributing to ice loss. ­The steep walls of the Ferrigno Rift plunge nearly 1.5 kilometers down at its deepest point. Being about 10 kilometers across and at least 100 kilometers long, it probably goes all the way to the sea. A joint team from the University of Aberdeen and the British Antarctic Survey in Cambridge discovered the canyon in the course of an exhausting 2,400-kilometer trek through the region that had only been visited once previously, in 1961. The discovery came as a total surprise when Robert Bingham, a glaciologist at the University of Aberdeen, detected the rift with an ice-penetrating radar system. But what is the connection between the discovery of this ancient, ice-filled rift valley and the loss of ice mass? The canyon is believed to be connected to the warming ocean, which itself impacts upon contemporary ice flow and its eventual collapse into the sea. “We conclude that rift basins that cut across the WAIS [West Antarctic Ice Sheet] margin can rapidly transmit coastally-perturbed change inland, thereby promoting ice-sheet instability,” Robert Bingham and his co-authors from the British Antarctic Survey wrote on July 25 in their Nature article. 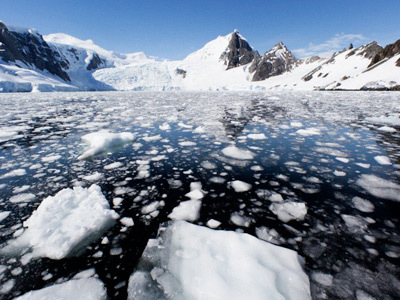 The ice sheet of West Antarctica is diminishing faster than in any other part of the continent. Some glaciers are shrinking by more than one meter per year. At the same time, it accounts for some 10 per cent of the global rise in the sea level. Understanding these processes is crucial for our ability to predict future behavior of the ice flow, as well as the global rise in sea levels as the climate continues to warm. Over the past two decades, satellite observations revealed consistent and substantial ice losses from around much of Antarctica’s coastline. “What’s particularly important is that this spectacular valley aligns perfectly with the recordings of ice-surface lowering and ice loss that we have witnessed with satellite observations over this area for the last 20 years,” Bingham explained. Diminishing glaciers in various parts of the world are becoming a major concern for scientists. 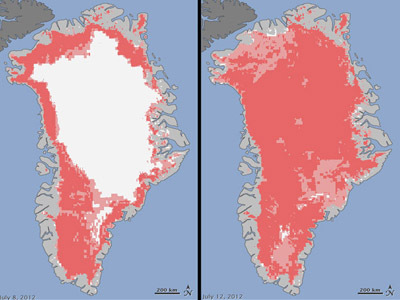 In July, observations from three NASA satellites showed an unusual melting that occurred in a flash over a widespread area in Greenland. Even the island’s coldest and highest point showed signs of melting – on a scale unseen since the beginning of satellite observations some 30 years ago.